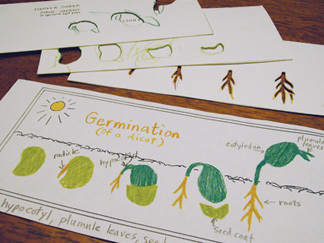 Students use three stencils and colored pencils to create a simple picture showing the stages of germination. An adult will have to prepare stencils ahead of time. Actual activity only requires about 15-20 minutes. Copies of stencils on card stock (plus laminating plastic if possible), X-acto knife, photocopies on regular paper, colored pencils.